Wrought iron stools with reupholstered seats - wool suiting fabric. 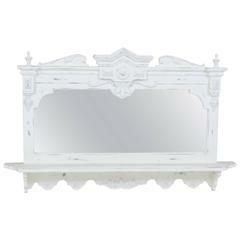 Distressed white painted hanging wall mirror with shelf. 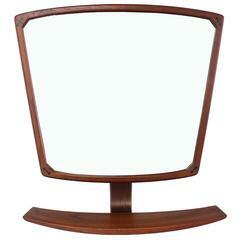 Nice Mid-Century teak modern wall mirror vanity. 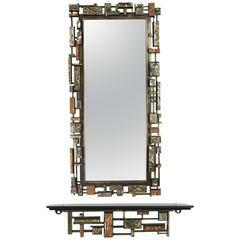 A mahogany mirror with attached shelf and brass gallery. Original glass and applied brass banding. 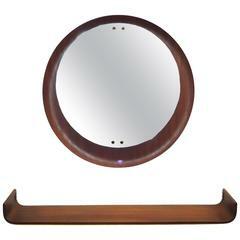 Beautiful round mirror, giving a heavy and robust impression, combined with elegant details. Condition: Very good original condition. 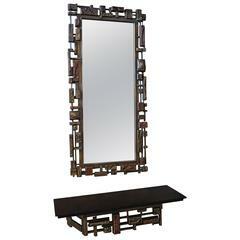 Stilcasa Creazioni, nice Mid-Century teak modern wall mirror and shelf. 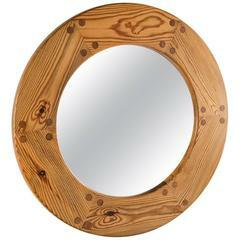 Mirror circumference 59.5 cm. Shelf size in cm: H 8, W 85.5, D 17.2.